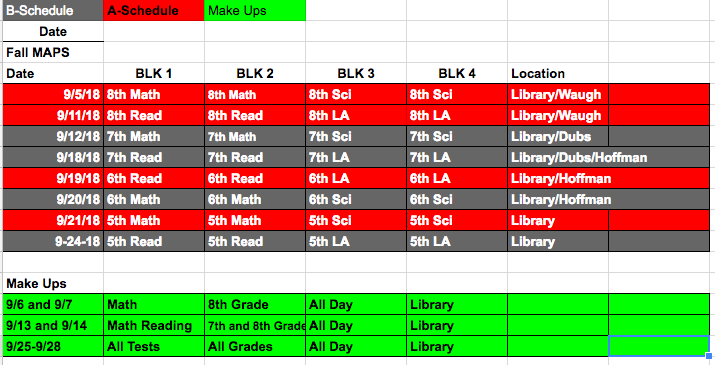 Below is the assessment schedule for the Fall MAP Growth Reading, Math, Science and Language Arts tests. The data that we get from the fall assessments informs teachers of specific areas where students need intervention and enrichment. The benchmark data also informs students when they set their annual growth goals with their teachers. Chadron Middle School will host the first of our monthly Parents as Partners meetings on August 27th at 6PM in the CMS Library. This month, parents will be introduced to E+R=O, which is a concept that CMS students will learn about throughout the school year. The slides that were used during the student learning sessions on 8/23 and 8/24 are below. We hope to see you on the 27th! CMS had another flood last night. Two third floor, 5th grade classrooms, the band room and the girl's locker room were affected. We will have a regular day of school today. Mr. Calkins' and Mrs. Hinman's classes will rotate to unoccupied rooms throughout the day. All other classes will carry on as usual. Just a reminder that all students need to be updated on immunizations when they begin school. State law requires that students entering the 7th grade have an up-to-date physical and one dose of the immunization: Tdap (tetanus, diphtheria and pertussis booster). To schedule an appointment at the Dawes County Immunization Clinic call (308) 432-8979. Failure to meet these 7th grade requirements (physical and immunization) will result in the exclusion of your student from school. Please get these done ASAP. It is with regret that CMS must reschedule the Open House from August 9th to August 14th from 5:30-7:00. There was a roof leak that flooded both bathrooms and two classrooms on the 3rd floor. We are in the process of replacing carpets and repairing the bathrooms. Students should bring all of their school supplies to the Open House on August 14th and they can put their supplies in their lockers at that time. Mrs. Rogers, Mrs. Summers and Mr. Dressel will be available to help students remember/find combinations and locker numbers. Both parent-student meetings are still scheduled for August 9th. The 5th grade meeting will be at 5 PM and 6th-8th grade meeting will be at 6. Although the building will be closed, 5th graders will get their locks so they can practice. For those who cannot attend, I've included several slides below that highlight the main points of the meeting.